It’s a Dream, Not a Race. 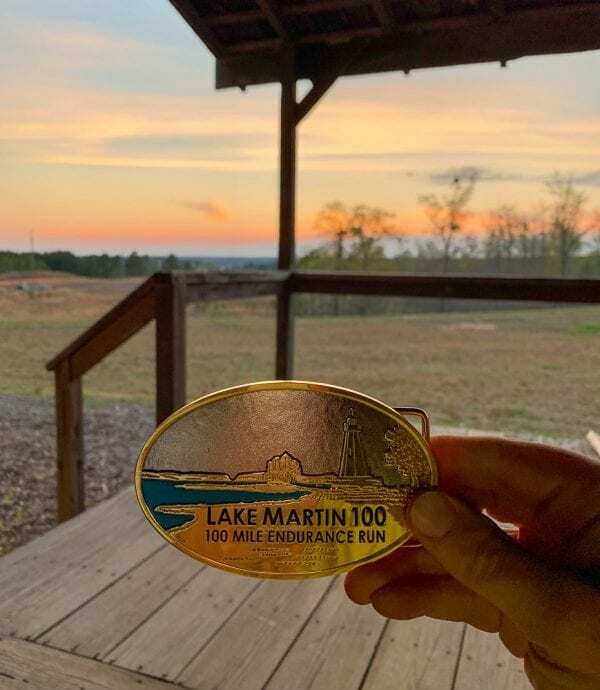 Lake Martin was my first 27 mile race in 2016. My first 50 in 2017. My first 27 with Rachel in 2018. I wanted it to be my first trail 100. I planned it for over a year. Before Rachel and I did the 27 together last year, I knew I wanted to go for 100 this year. That’s a lot of time to think and talk, to plan and train, to powwow with a handful of other like-minded people in Facebook groups, and to dream. 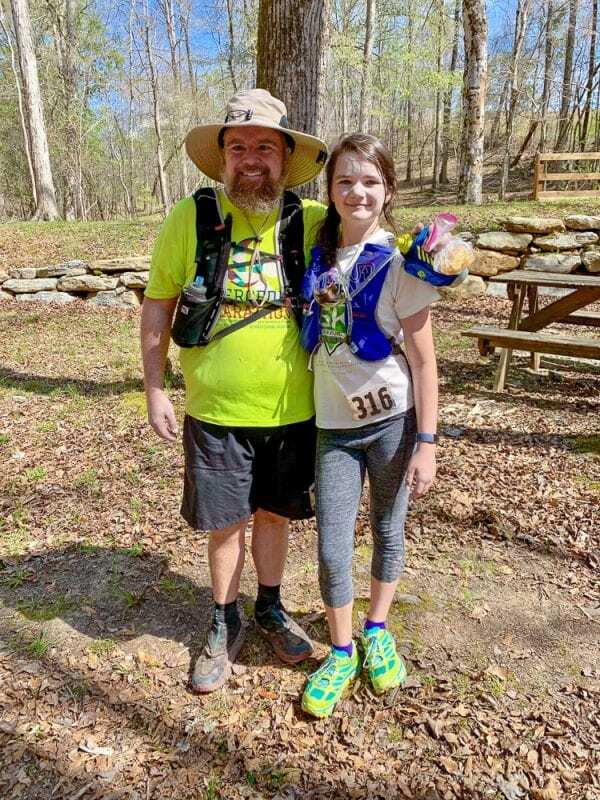 By the time we arrived at the lakeside rental cabin on the night before the race, “me” had turned into six people (me, Rachel, Christen, Kelly, Ashley, and Ali), four of them there for their first 27, including my 12-year-old daughter Ali (she wrote her race report here.) It’s fantastic that the magical community atmosphere and scenic adventure of this race is spreading to other people. The trails are all on private property of the Russell Forest Trail System. The basic race is a 25 mile loop, with 4 sections. The 27 Mile Fun Run = 1 loop plus a 1 mile out & back with a turn-around point at mile 26. The 50 = 2 loops. The 100 = 4 loops. There are two aid stations full of fluids, food, people, love, help, smiles, and festivity. All you could want. More than you need. These people really care and will care for you. I had not trained with long distance or speed, but with time on my feet. Morning runs were frequently followed by afternoon hikes with the family. 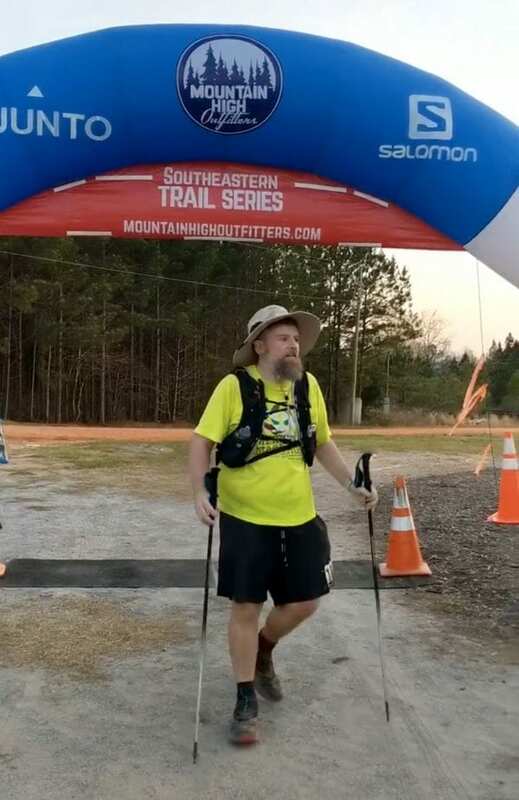 I also did a lot of mental preparation, listening to podcasts, reading race reports, and reading books by ultrarunners to prepare me for the mental fight against quitting. My plan was to maintain a steady-state, focused on physical efficiency, conservation, recovery, and mental tranquility, knowing that the heart of finishing a 100 is in the unknown, in the ability to solve problems that arise that you don’t anticipate, when you are at your weakest and it’s hard to think clearly. I also tried to improve my odds of survival by taking advantage of the medical knowledge around me. As training wound down, I had some plantar fasciitis in my right foot, and a friend, Kristen Zeanah, a PT who makes house calls as 10X Physiotherapy, gave me some helpful treatment and solid recommendations. House calls! The wisdom Rachel has acquired in her fight against dysautonomia has had ripple effects to helping many people, including me. Before the race, I got a vitamin-loaded IV bag, a month of red light therapy, and fancy electrolyte powders to drink. Several people asked me before the race: Are you ready? Susan Donnelly, a guest with Suman Silwal on his MRuns podcast, gave my favorite answer: “A new distance, a new challenge, is always a leap of faith. 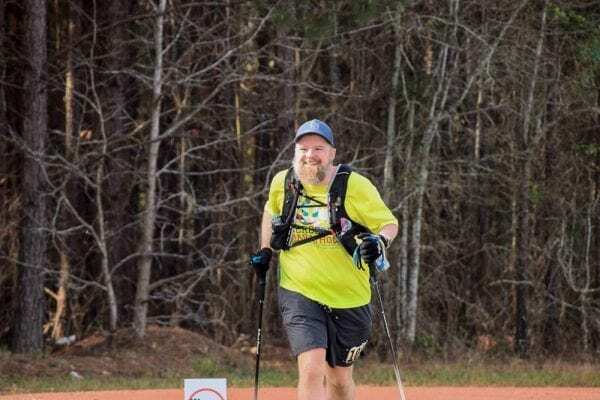 You don’t know if your body can endure it, but you believe it and try.” Suman is a Birmingham running icon, and the only now 6-time finisher of the Lake Martin 100. Friday night we enjoyed the pre-race dinner and Suman’s traditional speech. This year the slogan was: “Give your body a chance to finish.” I hoped I had done enough to give my body that chance. Saturday morning I was up at 3:30, having water, coffee, and my traditional brown sugar and cinnamon Pop Tart. 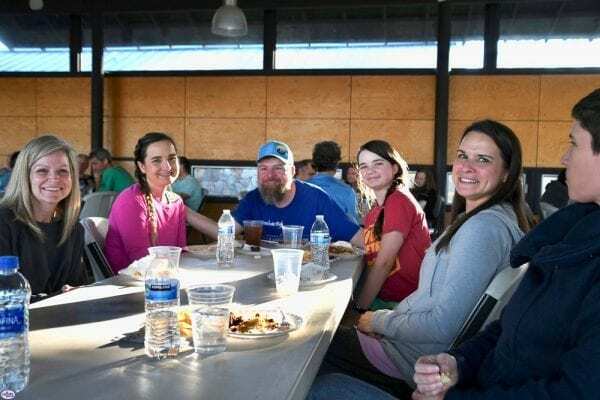 We arrived about 20 minutes before the race started, and I staked out my personal aid station with the Paloma Blancas, some friends who graciously invited me to join them for the weekend. I laid out my chair and box full of supplies in a corner of their tent near the start/finish line and cabin aid station to use for my numerous resupply stops, gear swaps, and wardrobe changes. The first 26 miles was mostly spent with Rachel and Ali. It was a fun, festive, beautiful day, and I was happy to be with my family in a place I’ve grown to love. I try to take care of my feet. (Remember in Forrest Gump in Vietnam where Lieutenant Dan tells them to keep their feet dry?) I put Bodyglide and diaper cream all over my feet. About four miles into the race, I slipped on a tiny log crossing, and planted both feet (kerplunk!) completely underwater. It took me a few silent minutes (other than the squishing of water in my toes) to settle down the fury in my head. This race generally does not require you to get your feet wet at all. The creek crossings are easy. I had extra shoes, socks, and diaper cream in both of my drop bags, but the more I thought about it, the less I wanted to focus on maintaining perfect foot conditions. That was a good call, because I clumsily got my feet wet half a dozen times throughout the race (I didn’t try to cross that log again.) I went with “if it ain’t broke don’t fix it.” I wore the same socks/shoes untouched the whole race. I hugged Ali at the out/back turn-around at mile 26 – it was such a proud dad moment. I was sorry I couldn’t be there to see her finish, and said goodbye to my wife and daughter. I’m so proud of Ali for finishing strong and happy and so thankful to Rachel for training, supporting, and pacing her. I would be alone from mile 26 to 78+. As good as the weather was, the hot afternoon was more of a struggle in the sun than I had hoped. But I felt strong, and moved conservatively and consistently, trying to focus and enjoy the moment, and not worry about the giant task ahead. Then, after a beautiful sunset, the cold night became a much deeper struggle as the temperature felt much, much lower than the forecast 49. I have no idea what it was. My short sleeves were no match for the thick, damp cold that settled on my body and crept deeper and deeper into it. My breath was visibly thick in the light of my headlamp. My knees and sore legs ached in the chill, and stiffened, slowing my pace. It was frustrating. My legs just wouldn’t go as fast as I wanted. I tried to get warm at the aid station heaters, drinking hot broth and potato/rice soup, but that only lasts for a few minutes. So the logic became: just keep moving until dawn. The sun will be up in 8 hours. Keep moving. The sun will be up in 6 hours. Keep moving. As the first light began to creep over the horizon, I began to have math problems. I wasn’t using my GPS watch to track my pace. 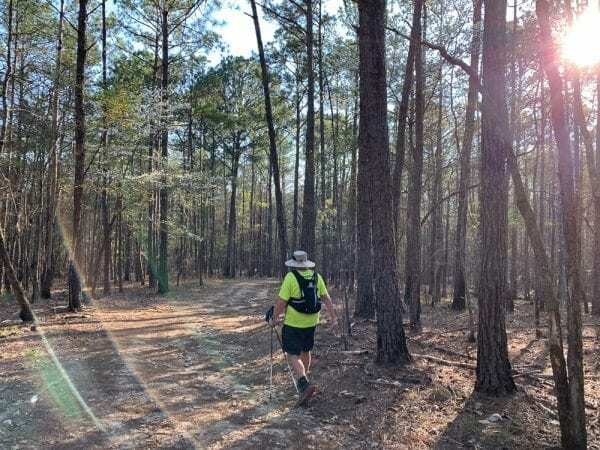 I was running on perceived effort, aid station to aid station, watching the cutoff paces on a folded chart in my pocket, and trying to conserve my body and use all the time I was given. But the cold night had slowed me too much. At this pace, I couldn’t be finished before dark. 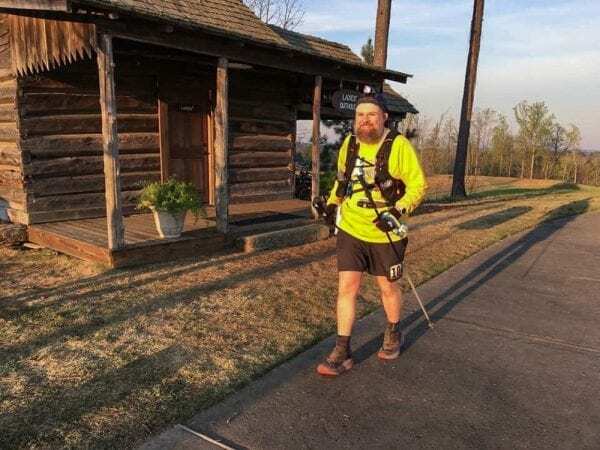 In my foggy brain, I tried to add it up again and again, but coming into the Cabin Aid Station at mile 68 I faced the death of a dream. I’d continue on at least to 75, maybe 83 – I had all day, but I had to tell David and Marye Jo that I wasn’t going to make it. I tried to keep things in perspective – I have a lot of wonderful things in my life, but in that moment, tired and hurting, I was devastated. 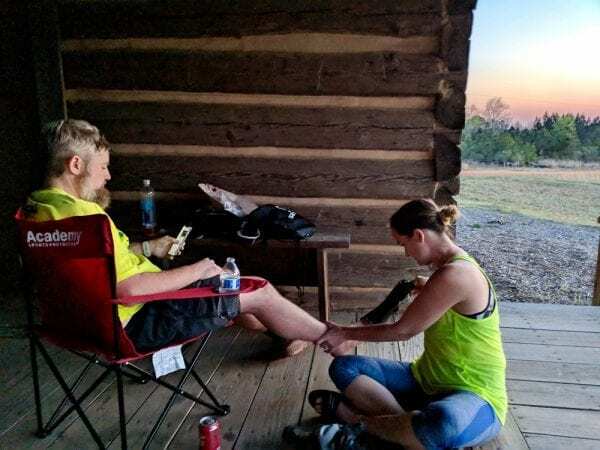 I finished loop 3 section 3 (63-68), and found David and Marye Jo. The sun was wide awake, shining brightly. I told them my math, and tried to hide my sadness. But the Tosches were so encouraging! They just quietly smiled at my stunned face. Are you serious?? Okay then!! A warm smile began to grow deep inside me. I refilled my bottles, and headed out for loop 3 section 4 (68-75). I ran like I hadn’t planned or trained to do at all in this race. I flew through the woods, careening down hills and leaping rocks. I couldn’t believe I was capable of this effort level after the night before, but I was so invigorated by the possibility that I could still have my dream. This was at high risk of falling, getting injured, and blowing my energy reserves (see you later race plan! ), but it sure was fun! The fast running warmed and loosened my cold stiff legs and knees. I was back! I finished that section in 1.5 hours with a huge smile on my face, and left myself just enough time to reasonably do the 4th 25 mile loop before dark. I backed off my frantic pace but kept pushing myself as I felt I could, pushing hard up the climbs with my trekking poles and letting gravity scoot me down as fast as it liked. 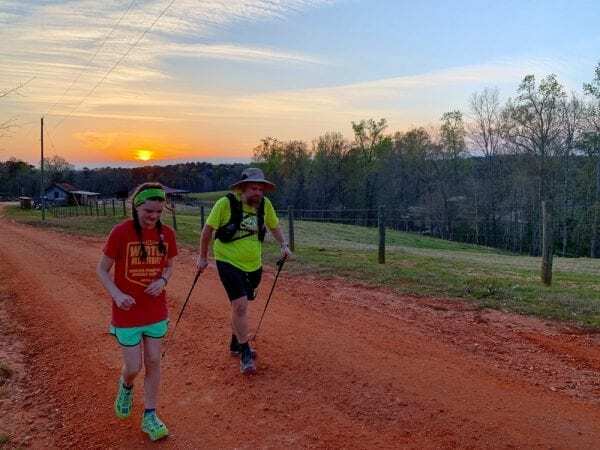 Rachel paced most of section 1 (75-83) and all of section 2(83-88), and tolerated my groans and frequent stops to lean on my poles and get my breath. She kept me entertained with stories of their post-race celebrations and recovery from the night before. I noticed on section 2 that I was really hot and my mouth was pasty dry. I had been drinking fancy electrolyte drinks, but I decided not near enough water. I was CRAVING ice water. I filled up my 1.5 liter bladder at Heaven Hill, and dumped ice in my hat. By this point, I was last, and everyone knew it. The last two Heaven Hill aid station workers drove away right after I left for the last time, smiling and waving as they went. They were there just for me. Kelly paced section 3 (88-94), and listened patiently to my teary devastation/rebirth story from the night before. I had another burst of energy for this “easier” section and powered through it quickly. I drained the first 1.5 liters of water and refilled it again before section 4. Did I mention I was last? 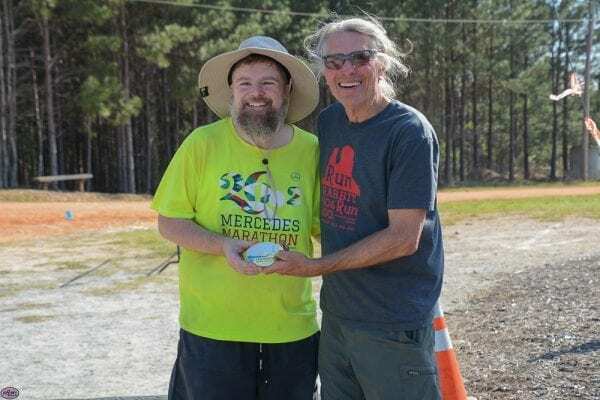 When I finished 94, David and Marye Jo needed to leave, so he gave me the buckle, we took pictures, I got a few congratulatory hugs from the last couple of folks there, and then, unwilling to let it out of my possession, I put the buckle in my pack and carried it the final 6.3 miles. David gave Rachel his cell number to let him know what time I finished, and off we went on the last section. I expected the finish line would need to be taken down by the time we came back. Rachel paced section 4 (94-100) and quietly followed me as I started to fade, really fade. She was struggling herself at this point, having run 27 the day before and then pacing me almost 18 grindingly slow miles. This wasn’t her first time for end-of-100 pacing at great cost to her own body. I sat down on a log and thought I’d kicked over an old wasp nest or something similar. Rachel says there was literally nothing there. I still say it was there. The waves of exhaustion started to wash over me and I struggled to will my body to keep moving. In my excitement of actually doing loop 4, I hadn’t taken in nearly enough calories, but I was soooo close. Rachel began regularly offering me a few spicy gummy bears and pretzel goldfish to try to get me there. She says the gummy bears weren’t spicy, but I know what I tasted! I was still struggling with the heat, and I felt a strange sensation. A bead of moisture on my left temple. After consuming 2.5 liters of ice water rather quickly, I started sweating. Oops. I had no idea how long I had stopped sweating. Kelly and Ali met us near the end at a lovely creek crossing with an inviting bench, appropriately named Rock Bottom. I passed up this last chance to rest, focused on the finish, and pushed toward the end. 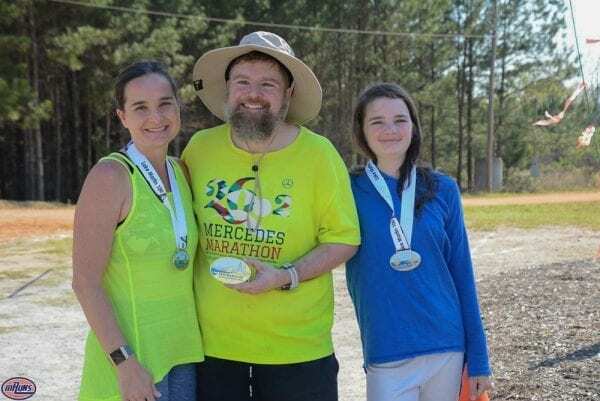 My ultramarathoner wife and new ultramarathoner daughter were beside me, while new ultramarathoner Kelly took the video and pictures. Dark Time: Who cares? I was off the trail! The finish line was not gone, but was still waiting patiently when I jogged up Tucker Road for the last time, just as I had imagined it. We had the finish line and the cabin all to ourselves. Me, Rachel, Ali, and Kelly. It was surreal, my tired crew alone there in the glorious sunset, like a dream. As if it was all there just for me. They left it up for me. And in decent weather, they would leave it up for you. Or anyone. Because these people are the kindest and best of humans. I settled into a chair with a groan, and Rachel graciously took off my shoes and socks. I think she was curious about the carnage, but it wasn’t terrible. The sun was setting slowly behind the cabin porch. I thought to myself, as I hear many others say, “That was amazing. I will never do that again.” A few days to reflect have softened my stance. My overall time was 36:00:05 – the second slowest on record, and I couldn’t be happier. 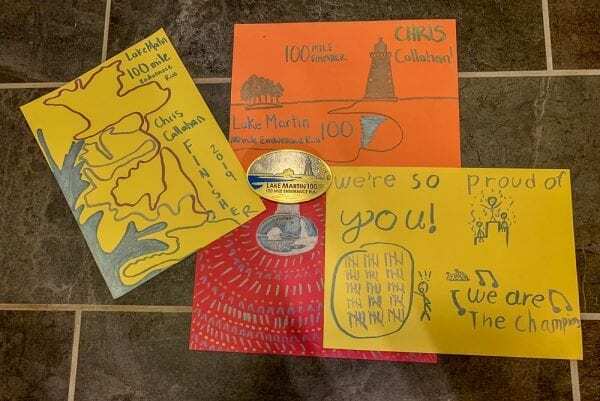 Ali and Kelly presented me with special custom awards they made while they waited on me to finish. I know that doing 100 miles takes a toll on your body. I already knew I had a few blisters and some thigh chafing. I’m pretty sure I may lose a toenail or two. Of course everything from the waist down ached. That had been true for much of the race. It’s been several days, and I feel good physically. I took five days off of exercise, and then went for an easy run. I’ll limit my effort level for a few weeks to make sure I give my body the chance to fully recover. Fun fact: I dreamed about being in an eternal race for several nights in a row after the non-eternal race. I am so thankful to everyone involved. The race volunteers took wonderful care of me for two days. My friends sent tons of encouraging messages throughout the week and the race. Rachel went above and beyond as usual to keep me alive. Ali cheered and hugged me along on both days. Kelly was up for anything to help. And I still get a little misty when I think about the kindness and compassion of David and Marye Jo. Thank you so much for putting into words this grueling endeavor. It’s so incredibly amazing what you were able to will your way to do. I have so much respect for you and your faithful, sweet wife. 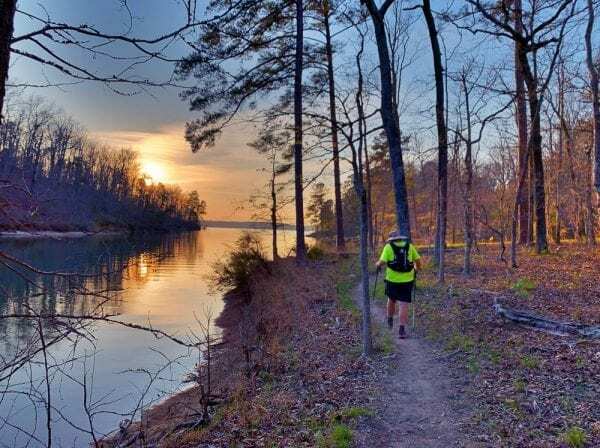 I’ve always been curious and fascinated about what goes through the minds of ultra marathoners as they somehow plow through 100 miles – the mental toughness /stamina. And then, the whole physical torture to the body. I just cringed when I read how your feet /shoes got soaked at mile four. Oh man! I’m in awe and so very impressed at what you did. And Rachel, you are absolutely incredible! You running your race and then multiple other runs, along with maintaining mental toughness to help Chris along. And Alli! Wow, so young and so tough. Well done everyone! I’m impressed with how positive and grateful you were/are Chris. You guys are champions! Thank you so much for sharing this inspiring story of not giving up! 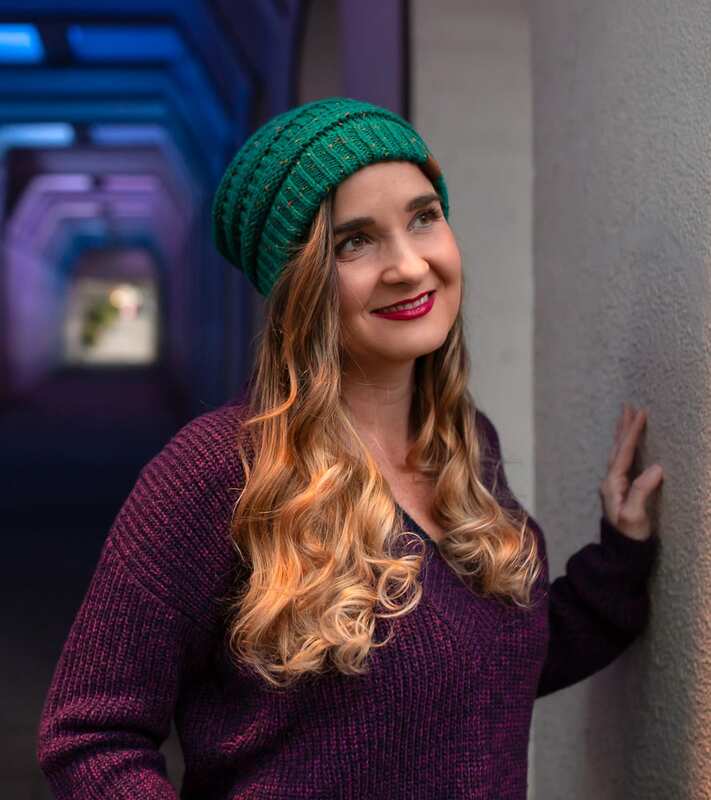 I LOVE your blog, Rachel! Thank you so much! YOU are an inspiration!! This is an incredible journey you’ve completed, my brother. Bookmarked! Love ya man. I am in awe of your determination and your journey; you and your family are definitely an inspiration. I am super proud for you Chris, Rachel and Ali (and for your friend Kelly). Keep doing what you guys love. See you on the roads (lol). We’re so proud of you! This was a HUGE accomplishment! What an incredible journey. I’m glad your dream came true! Well done ! So amazing your journey and the many gifts and blessings you received along the way. You did it! So well done!!! Great accomplishment! Wow. I’ve always wondered how runners make it through extremely long-distance runs, so your insight was incredibly interesting. I’m amazed by you, Rachel, and Ali–your determination to finish, Rachel overcoming her physical obstacles, and Ali’s willingness to put in all that hard work at her age. You guys rock! Way to go Chris, I’m amazed that you or anyone can do this! Wow! Such a huge accomplishment! I am truly amazed that you guys did this! Congratulations!!! This was a little hard to read. I was stressed for you. But it was a happy ending! And I’m so proud of you and the rest of Crew Callahan! Super inspiring and a great read! Congrats! Beautifully written and what an accomplishment! 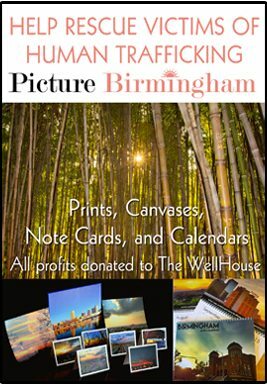 Tommy and I have commented several times that you ran/walked further than the distance from Birmingham to Montgomery or to Huntsville! I can’t even imagine that in my wildest dreams. Thanks for sharing your perspective of those 36 hours. Proud of you, Rachel, and Ali! Awesome!! I am so beyond impressed. I have done half marathons and marathons ( I race walk.. as apparently my area of talent is the craziest looking sport ever) but I am itching to do an ultra one day.